My Thursday is unreasonably thirsty. So let’s do something about it. Something pink, naturally. Can we talk about this syrup?! I am in severe lust. Why I haven’t made a champagne syrup before, I have no idea. I’ve clearly missed out on tons of possible cocktails. Must make up that time. Must make it up. And that’s the thing! While I chose to make mojitos, yes because I love them but mostly because I’ve more recently made a margarita and sangria, you can use this syrup for everything. Any kind of cocktail or drink – and I sort of also want to pour it over sponge cake. It’s kind of difficult to tell in these photos, but the drinks have the slightest hint of blush color – they are so pretty! Definitely can brighten up these winter months, but will be even more fun come Spring and wedding season and Easter and well, Wednesday night in three weeks or so. You can use whatever champagne you’d like, but I would recommend one that isn’t super sweet. It’s replacing the bubbly selzter/soda in the mojito – something that isn’t so sweet, you know? But use what you love. If you use a sweeter one, just play with the rum and lime juice and syrup. And maybe make a double? Luckily, I had no problem finding fresh mint at my grocery store at the moment, even in the dead of winter. Thanks 2016 universe. If you can’t find it, perhaps go the margarita route. I will say that these are making me so super excited for warmer weather and sunshine. Tons of it. Speaking of sunshine, remember when I mentioned that I lost my favorite sunglasses earlier this week? WELL. It’s a whole long mess but I accidentally (definitely not on purpose this time) ordered FOUR pairs because my brain is a trainwreck so come this weekend, I will have four pairs of the exact same sunglasses showing up at my door. I swear I did not drink five champagne mojitos before online shopping. Thank goodness for return policies. And champagne mojitos after returns! Oh and the best part is that this morning? I found my lost sunglasses. So there’s that. Winning? Yield: 1 serving, but is easily multiplied! In the bottom of a glass, add 1 ounce of the syrup and the mint leaves. Muddle with a muddler or use the clean bottom of something blunt, like a screwdriver! Add ice to the glass, some lime wedges or slices, and pour rum, remaining syrup, lime juice and champagne over top. Mix with a long spoon or knife and serve with an additional big sprig of mint. Combine the champagne and sugar in a saucepan over medium heat. Bring to a boil while whisking constantly until the sugar dissolves. Turn off the heat and let the mixture cool to room temperature, it will thicken slightly. You can store this in the fridge for a few weeks! P.S. let’s make some popcorn. Wow. Such gorgeous photography. I cannot wait to try this recipe! These look so nice and classy! Love it! KILLING IT with the food photography today, girl! Ohh!! These are so beautiful! I am hosting a bridal shower next month and I was pretty stuck on the drink menu. These will be perfect! Mojitos all around!! I’m glad you found your lost sunglasses! And that there are return policies, haha. These drinks look amaaaazing! Mojitos are one of my favorite drinks and these totally take them up a notch. I’m so making these this summer when my mint plant starts doing better! These look incredible! I want to try them immediately! These pink mojitos make my entire w̶e̶e̶k̶ …. life. I had to laugh about the mint because Hannah made spring rolls the other night, and she put whole mint leaves down the side and I thought “that seems like a lot of mint”, especially since it was not chopped up, but whole. She and Jacob each took one bite and spit it out – they said it tasted like toothpaste! I enjoyed it, although I did pick a few off. 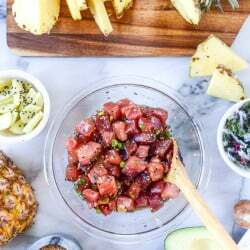 That looks delicious by the way – I am going strong on abstaining from alcohol since January 1, but when I am closer to goal weight, I am making these! OMG. Totally freaking over these! Mojitos are my drink of choice in the summer, but I have a whole mess of mint growing right now! These are totally going on the menu this weekend. Wow, these look delicious! Thanks for sharing! Random question… Do you have an ice crusher? I’m obsessed with crushed ice, but my freezer only makes those wonky wedge shapes. A meat mallet works wonders. Great idea to use champagne rather than seltzer water or club soda! I never would have thought. Mind-Blown… Just wondering what other drinks I can substitute champagne in for… :) Thanks for sharing!!! Oh my wow, these look amazeballs! Valentine’s Day cocktail for sure. Or maybe tonight. Or both. Question–does the champagne stay bubbly when you make it into a syrup? the syrup doesn’t stay bubbly, but the drink itself will be bubbly because you top it off with the champagne! Oh duh! I guess I could have read through the instructions! Haha! Thanks so much, Jessica!! These are SO pretty! And champagne syrup?! I want that over everything now. This top photo…is EVERYTHING! I want to plug this down! We are big champagne drinkers and these were YUMMY! And in honor of National Margarita Day, I plan to use the syrup to make margaritas this evening. Thanks for a great recipe. 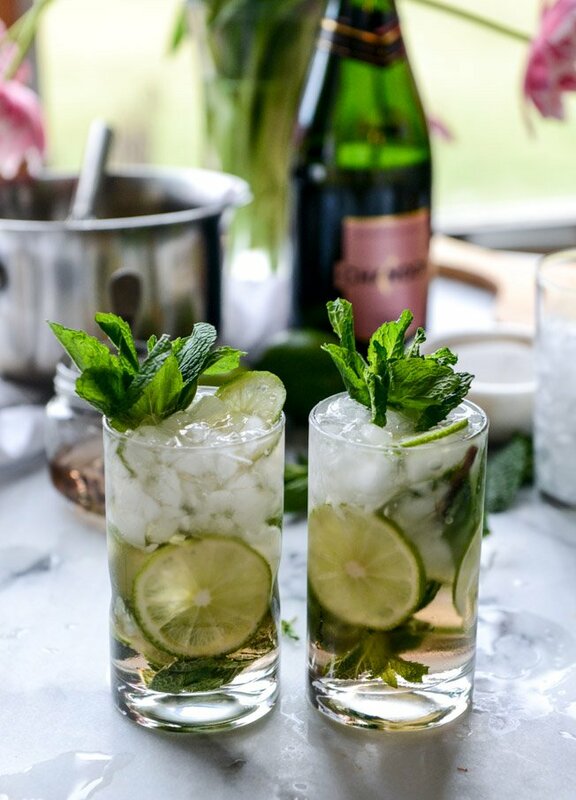 another interesting cocktail recipe, champagne syrup in a mojito, thank you again, nice recipe!